The official opening of the GRAND EXPO-URAL Week took place in Ekaterinburg-EXPO (Ekaterinburg, Russia) on the 18 September 2018. The exhibitors and visitors of the event were welcomed by Aleksey Orlov, First Deputy Governor of the Sverdlovsk region, Vladimir Bolikov, Deputy Head of the Ekaterinburg City Administration on the consumer’s market and services, Timur Irtuganov, General Director of the Association of furniture and woodworking enterprises of Russia, and Valeriy Prilipov, Vice-President of the Union of timber manufacturers and exporters of Russia. 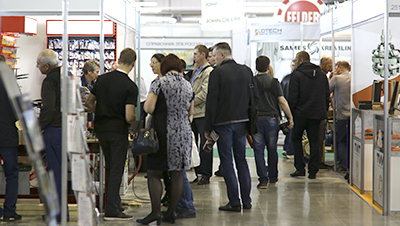 The four exhibitions within the Grand Expo-Ural Week will be completed with a packed Event Program for exhibitors and visitors. Besides, every day top managers and directors are welcome at the Sverdlovsk Region stand to consult representatives of the Forestry Department for the Ural federal district as well as of specialized ministries and departments of the Sverdlovsk region, including Ministry of Energy and Utilities, Sverdlovsk regional business support foundation, Ministry of Industry and Science, Forestry Department, and the Agency for Industrial and Ecological Safety. The detailed program of GRAND EXPO URAL 2018 is available here. To visit GRAND EXPO-URAL on 18 - 21 September 2018 at Ekaterinburg-EXPO (Ekaterinburg, Russia), please get your e-ticket.